MOSCOW • Russia says it is taking "unprecedented measures" to upgrade its military presence on the far-eastern Kuril islands claimed by Japan, including plans to set up a new base on an uninhabited island. Colonel-General Sergei Surovikin, commander of the eastern military district, yesterday announced plans "to develop military infrastructure in the area", the Defence Ministry said in a statement. He said Russia is taking the steps to "exclude the emergence of even the smallest risks". 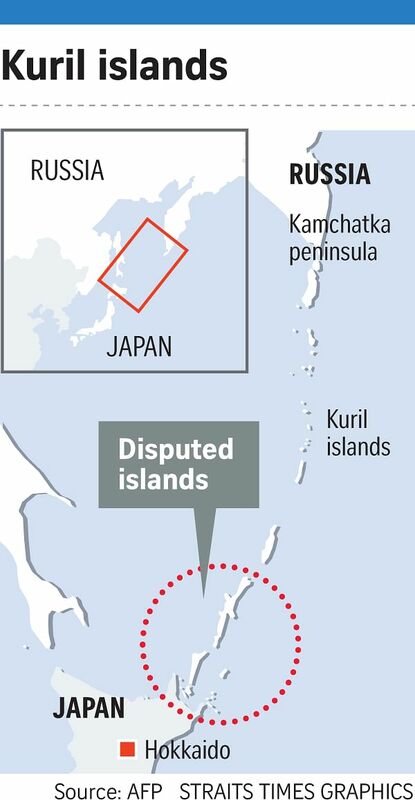 Russia has military bases on the Kuril Pacific archipelago, while Japan claims four of the islands in a dispute that has simmered since World War II, preventing the countries from signing a peace treaty. Soviet troops seized the four islands at the end of World War II just after Japan surrendered. General Surovikin listed the measures being taken as "a planned rearmament of the formations and units, and boosting the level of social protection" for all soldiers. Russia earlier this month sent six ships from its Pacific Ocean naval fleet on an expedition to an uninhabited island called Matua in the archipelago, which is not one of the four islands in the chain claimed by Japan and is closer to Russia. Gen Surovikin said the main aim of the expedition is to study the possibility of basing Pacific Fleet forces there. "The eastern outpost of Russia, particularly Sakhalin Island and the Kuril islands, provides unconditional guarantees of security and the territorial integrity of our country," he said. Russian TV showed army tents set up on the island as well as a cargo ship landing military vehicles. Troops have set up a field camp and organised water and electricity supplies and communications, Gen Surovikin added. TV reports said the island had housed a secret Japanese base and still has three airstrips and numerous fortifications. The bullish Russian statements came as Japan finished hosting a Group of Seven summit, which has snubbed Russia over its actions in Ukraine. Defence Minister Sergei Shoigu had said in March that Russia will deploy coastal missile systems on the Kurils as part of increased military spending in the region. Japanese Prime Minister Shinzo Abe visited Russian President Vladimir Putin this month at his holiday residence in Sochi, with peace talks high on the agenda. The Japanese Foreign Ministry said afterwards that Mr Abe had come closer to a breakthrough on the dispute and had proposed a new approach, while Russia said simply that negotiations between diplomats will continue.